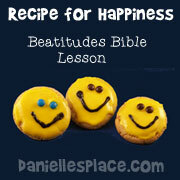 The following ideas come from the Sunday School lesson "Recipe for Happiness" on The Resource Room. 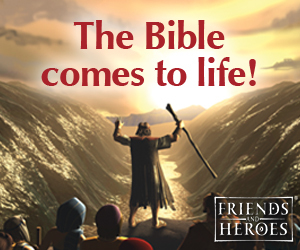 In this lesson children learn that the happiness the world offers doesn't last very long, but true happiness comes from God and obeying his words. This lesson goes with the lesson "Taste and See". 1. Print out cookie patterns onto card stock and cut them out. Print out hands and feet patterns and Bible Verse Patterns onto card stock and cut them out. 2. In class have your children color the hands and feet patterns to match the cookie pattern and tape them to the back of the cookie pattern to make a cookie man. 3. 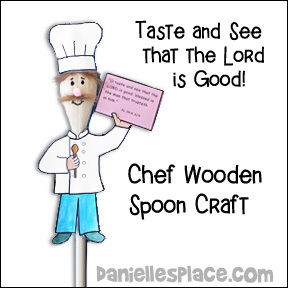 Tape or glue the Bible verse card to the cookie man's hand. 4. 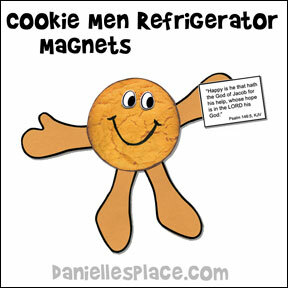 Glue a magnet to the back of each cookie man so your children can stick them to their refrigerators at home. 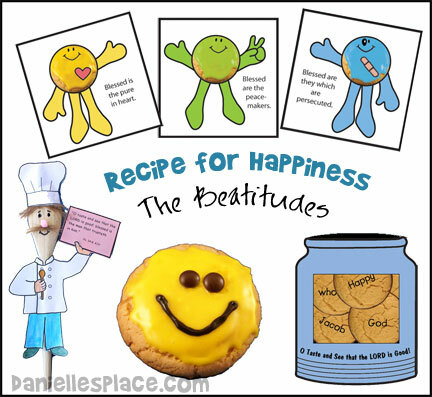 Before class print out each Beatitude Sheet and have your children color them. Tell your children that the will be used during the lesson. If you have more than eight children, make extras. You can use more than one picture during the lesson. To make this craft even more appealing use Kool-Aid paint. Empty a Kool-Aid packet into a cup and add just enough water to make it runny. Instant Digital Download - $2.00 - Eight black and white full-sheet coloring pages: Poor in Spirit, Meek, Peacemakers, They that Mourn, Righteousness, Merciful, Pure in Heart, and Persecuted. 2. In class have your children color the patterns and then glue them to the spoon. 3. Glue on hair, googly eyes, and a pompom nose. 4. To finish cut a slit just above the thumb and place the card in the slit so it looks like the chef is holding the card. Glue the card to the hand. 1. 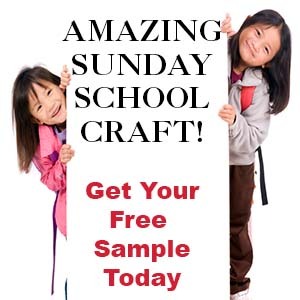 Have your children write the memory verse on one side of the potholder and decorate the rest of it with permanent markers both back and front. "I have to tell you what a blessing Danielle's Place has been. The lessons are age appropriate and the activities are great! My job as a Sunday School teacher is much easier now that I am a member. Thank you so much for contributing in the sharing of God's word." Before class print out cookie men cards and cut them apart. Patterns available to members only. In class place the cards face down on the table. Have your children take turns turning over two cards at a time trying to find matches. If you children are too small to read, read the words on the cards as they turn them over. They will help them to remember the verses and what they mean. If a child finds a match, have him read the words on the card and give an example of what is written on the card. 1. Before class make cookies and cookie jars from card stock and cut them out. Patterns available to members only. 2. 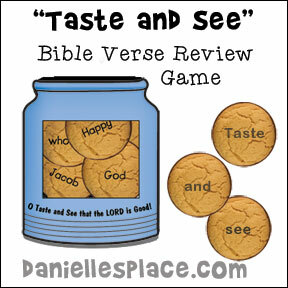 Write one word of the verse on each cookie. 3. Prepare the Cookie Jar. Fold the Cookie Jar Pattern in half and tape along the side and bottom edge. 4. Hide the cookies in the room. 5. After the lessons write the Bible verse on the board and go over the verse. Then have your children go and find one cookie each. Tell them to go back and sit down when they have found one cookie. When all the cookies have been found go over the verse again, one word at a time. Ask the child with the cookie with the word you are looking at to bring his cookie up and place it in the cookie jar; or have him tape it to the wall. You can also make a set for each child to take home and practice his or her Bible verse during the week. Use only the first half of the verse for younger children. Children, second grade through 5th grade, will love making this craft. Tape the crafts sticks together before class and have your children use markers to decorate the stick. 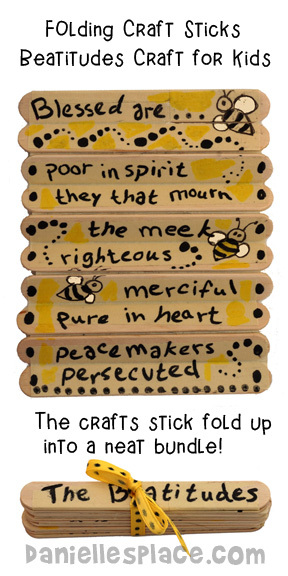 Go to the Beatitudes Craft Page for Directions to this craft.